Summary: Through this project, the Sea Turtle Preservation Society (STPS) will strengthen and improve its Stranding Program. STPS performs strandings for one of the busiest sea turtle nesting areas in the world. Over 2,000 volunteer hours were in stranding activities (does not include volunteer hours during cold stunning event). One of the main goals of the STPS is to provide stranding activities within Brevard County. STPS is an all volunteer organization (11,000 hours in 2010). With the funding, STPS will purchase of three RFID readers for ?pit tag? reader to improve the actual stranding report process through animal identification. 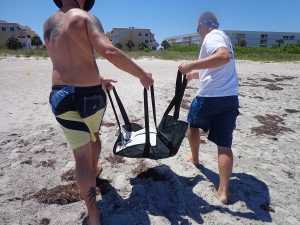 STPS will purchase fabric carriers to help reduce the response time getting injured turtles safely off the beach. Previous compact carriers have been utilized in the cold stunning event of 2010 and subsequent strandings. And, STPS will purchase waterproof and shock proof cameras for taking stranding photos. These photos are taken in a harsh and unforgiving environment. Results: This equipment was acquired to supplement the basic stranding kits provided by STPS to stranding team members. This equipment has be positioned throughout Brevard County. The carriers provide a safe, easy and more turtle friendly way of moving the animals off the beach to a transport vehicle. Due to the increased numbers of PIT tagged turtles in our area, the additional scanners will increase the accuracy of stranding report turtle identification. Digital photography has enhanced the information provided.